How many years of experience do you have and what got you into cosplay? This is my second year in cosplay. My first con that I went to was C2E2 2013. I had been making Halloween costumes and things to wear for many years but never knew about cosplay. 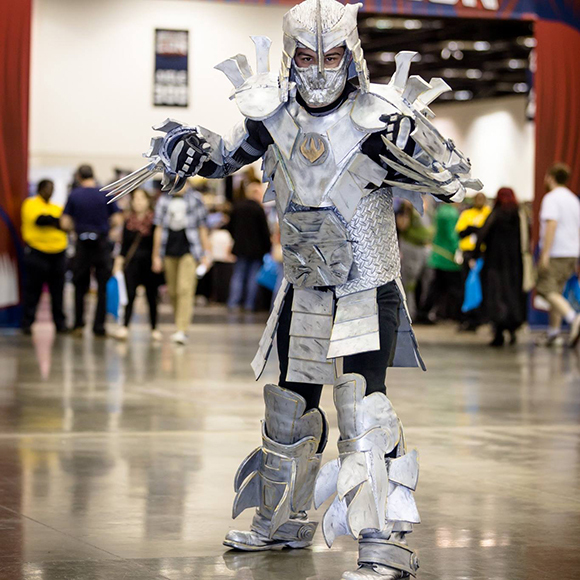 I decided that year to wear a shredder costume I made one day and the next day a flash costume. After being asked to take pictures with so many different people and seeing the joy in so many kids eyes I was hooked and never looked back. 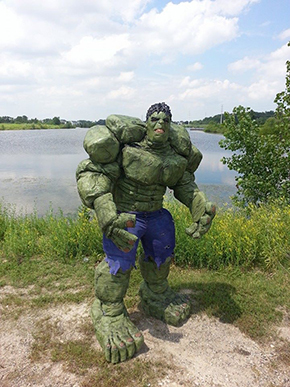 I think I am most known for my Incredible Hulk costume that I competed in last years C2E2 Crown championship of Cosplay. Another I am pretty known for is Shredder from the new TMNT movie. I just premiered my Yondu from Guardians of the Galaxy and it got so much more attention that I ever thought it would as well. I have to say my favorite Character to be is my incredible hulk. Although it is incredibly hot I am very mobile in it and get a lot of awesome reactions. As far as characters and designs I love. I love anything that is super popular and well known but not cosplayed very often. Those are the types of costumes I am drawn to. My first big costume before I became a cosplayer was made of a lot of hot glue and boxes. It turned out to be a pretty decent transformer for my first time and until this last contest was the only costume I had made that won a contest. Unfortunately I was not manning it when it won but still felt accomplished. So the answer to your questions no. I can hand stitch things alright but a lot more fabricating goes on then sewing in my costumes. But I am always learning and definitely would love to learn to sew. My techniques have improved from a lot of self discovery, online videos, pictures etc. Probably the most has been me trying out different ways to do things and see which I like the best. I don’t do a ton of research except for different pics of the character when I start building. I have a lot of strange techniques that probably not a lot of people do but it works for me. I love just roaming the thrift stores and looking for random items I can use to create costumes. I feel like everyone goes about different ways of making costumes. Some need to be more precise and like to use programs like pepakura. But I like to just wing it and make things in new ways. I feel that how long it takes is a hard thing to judge. When I work on a costume I am constantly thinking about new ways and ideas to do it everyday, so it is hard to put a timeline on my costumes. I do work a little bit under pressure and get a lot of work done right before an event like many other cosplayers do. My process is all over the place because I have so many things I want to do. I am probably working on 5 different costumes or projects at all times. It is just which ones I am more motivated to do more than others. I also become stuck or frustrated with a costume and will start on a different one and come back to it. So my process is all over the place but when I have a deadline coming up for one that’s when I start focusing on it more. I am currently doing a 20 day challenge for myself where I am documenting the next 20 days of building a costume for this Years C2E2 Crown Championship. The 20 days represents how many days I have till submissions close. So I am hoping to make a top grade cosplay in 20 days that hopefully can compete with some of the best cosplayers in the world. My Achilles heal would just be sewing in general. Feel that when I do my sewing it has to be a gritty beat up cosplay because my lines don’t come out straight and looks like someone on a dessert island sewed it with limited materials. Have you met any of the artists/writers/celebrities whose work your costume is based on? Since I recently have just got into the scene I have not met any of my characters artists writers or actors. I did see that Lou ferrigno was at one of the same cons I wore the hulk too but unfortunately I did not get to meet him. When you cosplay it is not very easy to get around and check out all the aspects of a con. Between all the pictures and being mobile in a costume its hard to see everything and meet everyone. 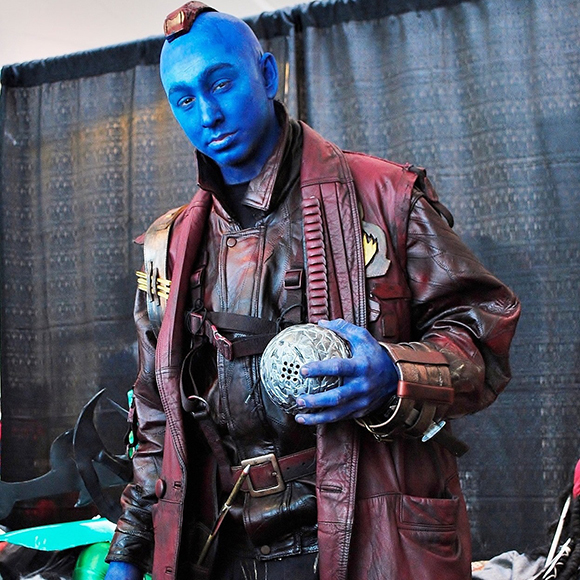 I would love to meet Michael Rooker in the future after this Yondu cosplay has blown up. Also thinking about doing a gotg/walking dead crossover of both his characters. The funniest thing that probably has happened to me at a convention is probably anytime I am wearing the incredible hulk and grown people want me to lift them up and hold them. I somehow gain extra strength and can hold people for a while but after while I get tired in costume and slowly start losing strength. So I have dropped multiple people while being the hulk. I think one of my best memories of cosplaying was when I was at Wizard world Chicago and a kid saw me in my incredible hulk costume and when I saw him his eyes lit up and he ran up to me and gave me the biggest hug. Anytime I can make a kids day in costume, it makes it all worth it. I do not read comics on the regular. I pick them up every once in a while to get new ideas or learn about characters but they are something that I would love to get into. I think my favorite comicbook character would be Spiderman, He just has an awesome sense of humor and his comics are really entertaining. As far as my favorite characters in general I am the biggest ninja turtle fan and have not gotten my hands on a lot of ninja turtle’s comics but they are something I would love to get into in the future. The comics are supposedly a lot more dark and grittier originally which I think is an awesome change. They just are such an expensive comic to buy. As far as cosplay my inspirations are anyone that cosplays for the love of it and not for the fame. Every kid that I excite or make their day is also my inspiration. 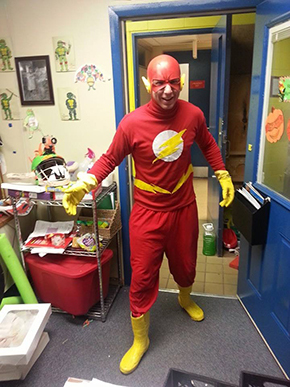 Its awesome to see grownups get excited about my costumes as well but with the kids, that is just making a memory that they will probably have for the rest of their lives. I still remember meeting the power rangers and ninka turtles when I was a kid and so many different characters that I loved brought to real life. The last person that really has inspired me in my Cosplays has been James T Wulfgar president and CEO of CosAwesome studios. He is just so genuine with everyone and promotes cosplay all the time. I have learned a lot from him and feel that I can always bounce my own ideas off of him and get a good response. 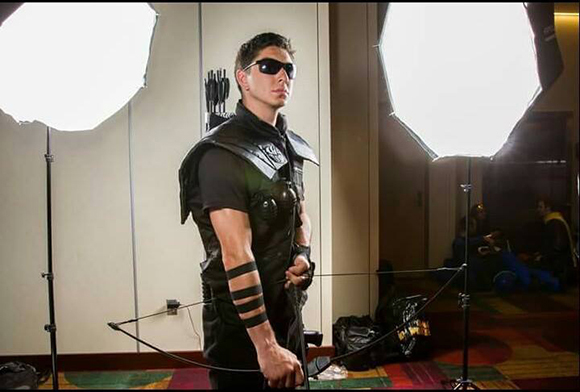 He also inspired me to create my own Cosplay group CosTacular Studios which is growing and hoping to have some awesome events coming up. Yes I have participated in multiple events through multiple different groups such as Costumers with a Cause and we are cosplay. I have done Late night at the Adler event, kids in capes, Bad Kids Party, a fundraiser at dave and busters recently, an event at the volo auto museum for toys for tots, and many others. Costuming is my hobby and I spend the majority of my free time doing it. I do enjoy to spend time with friends and relax and hang out but costuming is what I am constantly thinking about when I am not working. If you are wanting to get into Cosplay do it for the love of Costumes. Don’t feel embarrassed or that your costume isn’t good enough. Do it for the love of the character and to just have fun. Nobody should take cosplaying too serious that you are getting angry over things. It is a hobby and something that should be done just for fun. Do you know what your convention schedule is going to look like for the year yet? This years convention schedule is looking like Indiana Comic Con in a few weeks. The C2E2 of course. Then I am hoping to hit up Gen Con and Wizard World Chicago again. And if all the stars align and I can make a little extra money I am hoping to make the tip to Dragon Con this year. People can find me in tons of places. John Quade my facebook name. I also have a facebooko page for Johnny Quest. Please check out my page Johnny Quest Cosplay. Also CosTacular Studios and check out some of the amazing events we have coming up. We also have a site that is being built costacular.com and can email us at costacular@gmail.com. So hit me up however you like and I would be happy to answer any questions you have. Thanks for the interview and your time.